This material is suitable for white and light colored fabrics, cotton, some mouse pads, koozies, etc. It can be used in oil and non-oil based color laser copiers and printers. It is compatible with a wide selection of laser printers and copiers. This paper is great for transferring full color photographs and designs. It is extremely thin and has a soft hand. Printed images are bright and durable and has excellent wash resistance. Print – Print in mirror image. Use ‘Rough Paper’ print setting. Time – Prepress garment 5-10 seconds. Removing backing, place on fabric image face down. Top with Silicone sheet and press for 25 seconds. Care – Wait 24 hrs before washing. Wash inside out, gentle, warm or cold water, tumble dry. Do not dry clean. No bleach or aggressive detergents. CL Trim Free Light is for color laser printers and copiers and is a unique, single-step self weeding transfer paper for white and light colored fabrics. Developed to leave ZERO background in the areas with no image in the design – eliminating the need for trimming the image prior to pressing. Ideal for full color graphics and logos. Not recommended for photographs or designs with drop shadows, gradients and skin tones. Self-weeding paper reduces apparel production time. No residue background creates a soft to the touch screen printed feel. Foil can be applied on top of the image to create a unique design. Also, works great for black only graphics on dark colored shirts. Works on most Laser printers & copiers. *Although, testing has been done on the above printers, we strongly suggest you do your own testing, due to the extensive brands of printers on the market. Print & Cut – Mirror image. Use Rough Paper print setting. Time – Pre-press fabric for 5-10 seconds. Place paper on fabric with image face down & press for 25-30 seconds. CL Dark is designed to be applied to black and dark colored fabrics. 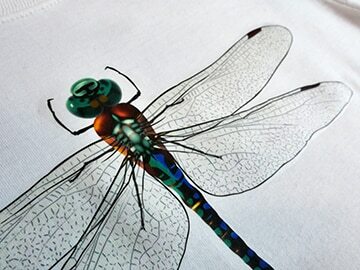 This paper offers excellent washability and produces a thin, softer transfer. Prevents dye-migration in Polyester garments. Can be applied to fabrics that require a low application temperature and it prevents scorching or discoloring of fabrics like canvas bags or heat-sensitive fabrics. Achieve multiple finishes just by choosing the correct finishing sheet. For a gloss finish, use a Siliconized Release Sheet and for a matte finish, use Transfer Tissue. As a one-step transfer paper for dark, you can either trim the Image by hand or use a cutter with an optical eye. Print – Print right reading. Use ‘Rough Paper’ print setting. Time – Pre-press fabric for 5 seconds. Removing backing material, place on fabric image side up. Stop with Siliconized Release Sheet or Teflon & press for 20 seconds. Care – Wait 24 hrs before washing. Wash inside out, gentle cycle, warm or cold water, tumble dry. Not suitable for dry cleaning. No bleach or aggressive detergents. This material is designed to be applied to black and dark colored fabrics. 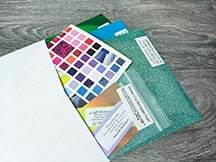 Developed to run through both Oil and Non-oil color laser copiers and printers, this transfer paper offers a thin, extremely soft transfer without compromising opacity or wash fastness. As a one-step transfer paper for dark, you can either trim the image by hand or use a cutter with an optical eye. CL Dark Premium withstands repeated wash and dry cycles with no deterioration of image quality! Time – Prepress fabric for 5 seconds. Remove backing material, place on fabric image face up. Top with Silicone Sheet & press for 30 seconds. Care – Wait 24 hrs before washing. Wash inside out, gentle cycle, warm or cold water, tumble dry. Do not dry clean. No bleach or aggressive detergents. Have a material sample mailed directly to you! We value and welcome your feedback regarding our products & services. Use our customer feedback form to help us help you!